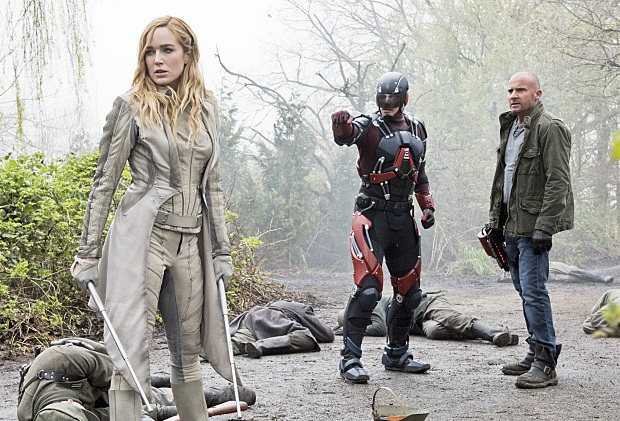 Ironically, Legends of Tomorrow ends the way it started — with a lot of promise. Back when the first episode aired, however, it was easier to be optimistic about the show. We didn’t know what we were getting into, but we also had no preconceived notions of the characters or plot. We cared about the individual people, but we didn’t really care about the team as a whole. Things are different now. We still care — more about some people than others, granted. But now we also care about their interactions, about Mick and Ray possibly becoming friends, about Ray and Stein geeking out together, about Sara and Rip and their complicated, and yet not-so-complicated friendship. Is that enough to get us to come back for season two? Before this episode, I would have said no. Now? Well, maybe I’m just a sucker for a good bromance, or the fact that the Savage plot is dead and buried is enough for me, but I’m in. Add to that the fact that Kendra and Carter won’t be returning thing (hallelujah) and it seems like Legends of Tomorrow has finally gotten rid of its dead weight. Well, except for Rip. He’s still there. But two out of three isn’t bad. If you’ve stayed with the show for this long, then you were probably on the verge of tears at the thought of Sara Lance losing her sister. The fact of the matter is, Laurel had lost Sara twice, but Sara never lost Laurel. So Sara finding out that Laurel died is a different kind of pain. It’s the kind that can break you. And it hurts because we love Sara. We loved her before this show even started, and we love her even more now. It also hurts because Caity Lotz can play the heartbreaking brokenness in Sara Lance like nobody’s business, and because the Legends of Tomorrow writers, surprisingly, dealt with Laurel Lance’s death better than the Arrow writers ever did. How did they do this? By focusing on the people that really loved her. Quentin and Sara’s first conversation is heartbreaking. Sara is so light, so carefree, and you know a trainwreck is coming, but you can’t stop it. You’ve been waiting for weeks for Sara to learn the news. And the pain, when it comes, is swift and merciless, with the desire to make it all better completely understandable. How could Sara not want to save her sister? And how could Rip possibly pretend to have the moral high ground in a situation like this? Except that it’s not about the moral high ground — it’s about the implications of saving Laurel. Sara might be fine with dying to get her sister back, but she would never sacrifice her father for it, which is what would have to happen. Because Sara understands Laurel. Sara loved Laurel. And, just as Sara was once an inspiration for her sister, Sara can now turn this tragedy around and make Laurel her inspiration. Her reason for living. For trying. For being better. It’s the best — the only way — to honor the Black Canary. For the first fifteen episodes of this series, I didn’t feel like these people were a team. They didn’t care about each other, really. And though they had a common goal, it was like they stumbled upon it by accident. They didn’t really want to be there for their own personal reasons, just for abstract “saving the world ones.” So they didn’t really try to function as a unit or a true team. Maybe it was Snart’s death that changed everything. Maybe it was just that, after a season of forced confinement, these people actually started to care about each other. Either way, the team that went up against Savage in this episode was, at last, an actual team. And what a difference it made. It wasn’t perfect, of course. There were still some absurd leaps of logic and some moments where you wondered if these people really cared about each other. But there was also Ray following Mick all the way down to Central City, Rip offering Sara as much comfort as he could and everyone deciding to go on an ill-advised rescue mission to save Kendra and Carter. There was the end, where they all decided to come together, once again, for another senseless mission. There was a spark. That, plus an actually dead Savage — three times over! — made this the best episode of the season. THE JUSTICE SOCIETY OF AMERICA! Yes, that deserved the all caps. Because this opens up the doors for a very, very fun second season. Plus, did I mention that Savage is gone? That, in theory, makes the show less cohesive in terms of plot, but since the show made no sense whatsoever even when they had a “big bad,” it’s probably best that they don’t have any sort of cohesive plot or bad guy after all. Carter and Kendra are also gone! Can I just say, good riddance? We didn’t see much of Carter, so he’s more of a footnote at this point, but what we saw of Kendra was downright disappointing. Our Hawkgirl wasn’t a warrior goddess throughout this season. She was a woman stuck between two loves. And in the end, that was just exhausting. Thankfully, Ray Palmer can, and has been, the bigger man on more than one occasion. He didn’t pout when she announced that she was leaving. He didn’t cry, and he didn’t even ask her to stay. He was just nice. And it’s understandable. She wasn’t “the one.” She knew it, he knew it, and WE ALL KNEW IT. And that leaves a show that can focus on Mick/Ray, Sara/Rip, Firestorm... yeah, now that sounds more like a team I could fall in love with. That sounds like I should actually tune in for season two. If you’d told me this about five episodes ago, I would have laughed in your face. But that’s the nature of TV. Sometimes you swing big and you miss big. And other times? Well, other times you actually hit it out of the park. “I had to bring you to May 2016, not January 2016.” There was not even an attempt at an explanation at the beginning of the episode as to why Rip did that. But I hoped there was a reason and thankfully I got one. This hologram trick would have come handy about a million times before, but okay. This episode featured a budding Mick/Ray bromance. I’m buying it. This show never really took full advantage of Stein/Ray, and it’s a darn shame. I love how just after Ray says, “not to dismiss what just happened,” he does EXACTLY THAT. Rip’s explanation for WHY Sara shouldn’t go back to save Laurel is both predictable and convenient. Shame on you, Legends of Tomorrow. Shame on you. Gideon is either the hero or the villain of this tale. I can’t decide which. “This is the craziest bad guy plan in the history of bad guy plans.” That is debatable at best. Comics are full of the crazy. When someone FALLS from a building, you can fly, and then you don’t move as they fall, that kinda makes you an accomplice. Two episodes ago, everyone was having second thoughts about killing Savage, and all the sudden in this episode, everyone’s a ruthless killer. Suuuuuuure. Gideon could have flown the Waverider into the sun by herself. Rip didn’t really need to go. “YOU’RE A MORON.” Yes, Mick. My point exactly. Between the Mick/Snart conversation at the end and the Lance family feels, I might have shed a few tears this episode. Raymond Palmer, stop being so nice. It’s disgusting. Did I mention that Carter is gone, Kendra is gone, and Savage is dead? Also, Mick Rory is now my favorite. The end. HEY IT’S MIKE FROM SUITS! MIKE FROM SUITS! (Also known as Patrick J. Adams.) And he’s Hourman! And he said “Justice League of America”! My geeky heart is jumping up and down. Thanks for reading! Legends of Tomorrow returns Thursdays at 8/7c this fall on The CW.